We’re thrilled to release a feature that has been simmering on a back burner since we launched DocumentCloud: more metadata! Using our document data tools, DocumentCloud users can tag documents with any values you need to store or search by. 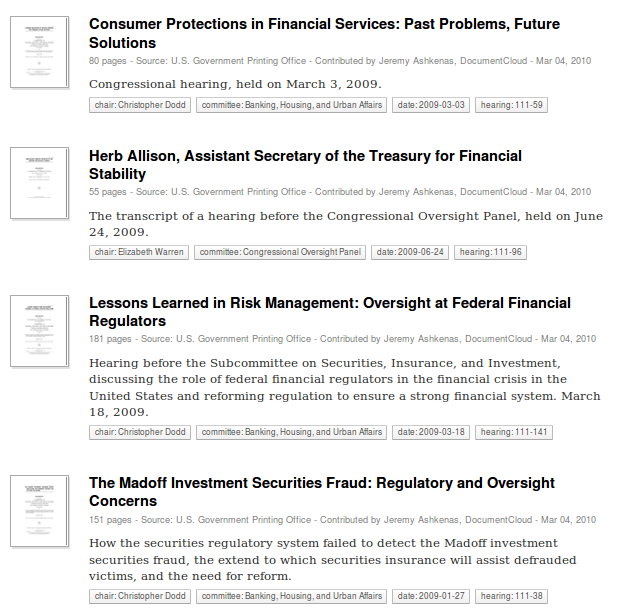 Organize hearing transcripts by committee. Tag a stack of emails with information about who sent and received them. Add FOIA request numbers or the date a published document was originally retrieved, and you’ll know much more about document provenance at a glance. The only thing you can’t do is add keys that will conflict with our built-in metadata or the entities provided by OpenCalais. Add, edit, and access document data through our API, or just log in and look for the “Edit document data” option in the edit menu, or look on the sidebar when you’re reviewing an individual document. 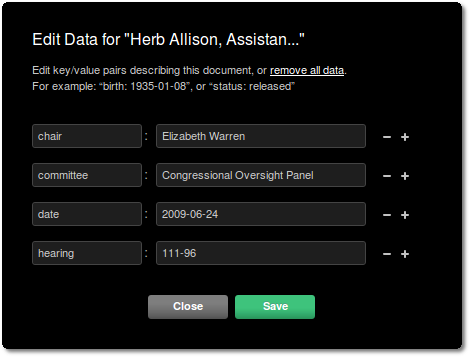 Once you’ve added metadata to a document, select any value to further refine a search. Find more tips on searching metadata in our documentation. Take a look at our sample set and let us know how you plan to use document data.